Your favorite ponies from Ponyville are all nice and sweet, so it just makes sense to have them decorating a cookie jar! 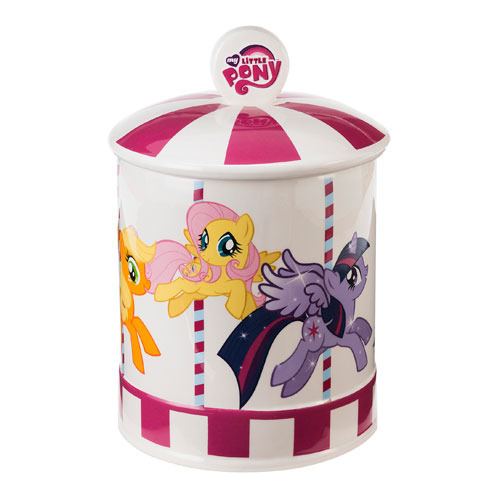 This My Little Pony Friendship is Magic Cookie Jar is made from ceramic and hand-painted with embossed detailing. With a wide mouth at the top, it is perfect for storing treats! It shows a fun image of Twilight Sparkle, Fluttershy, Applejack, and more, all looking like they're part of a carousel ride! Cookie jar measures 10 1/2-inches tall x 7-inches in diameter. Hand wash only. Not dishwasher safe. Ages 12 and up.